The big question: What to sell online to make money. This is the biggest battle for someone who wants to start a successful business online. It involves finding the right product, service or training. Most people that are ready to start their own business online have no or little idea what to sell online or where to start. What you must first understand, is that the form has little importance, especially when you start. Let me make it a little easier for you. You must specifically sell a CONCRETE RESULT. A result that will solve a problem that your prospects are looking online to solve. This is called a “Niche”. That’s why, it is PRIMORDIAL when you want to launch a “Niche” for a product, a training or a new service to ask yourself what your prospects & customers really want. It depends on your personality and your long-term goals. Blogging involves a lot of hard work and hours initially because you need to build a following, an audience first. And don’t expect to make money right away, it takes time and your potential customer need to know and trust you first. The beauty in blogging is that once you start getting momentum, once the traffic starts to show up on your site, the growth of your online business is limitless, and the profit margin is very high. 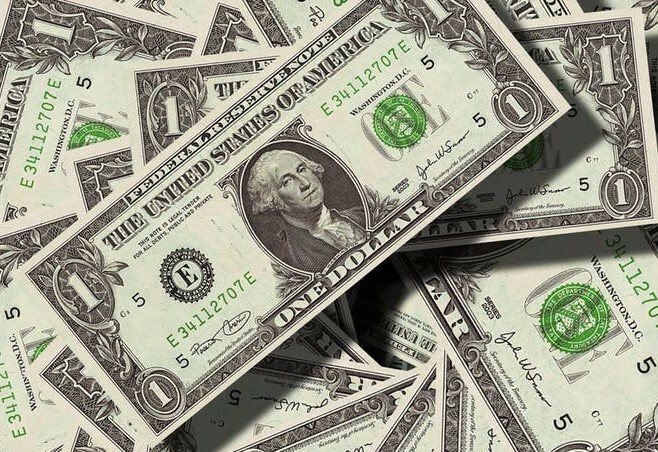 Money made from blogging is almost pure profit. You don’t have much overhead, no physical inventory and you don’t need much more than a computer and a website. Selling a product online involves a little less work, you don’t need as much traffic to start making money selling your own goods and the payout per sale is higher, but you must invest some money into it in order to sell something. Here is a graph that demonstrates the progress curves of both business models. 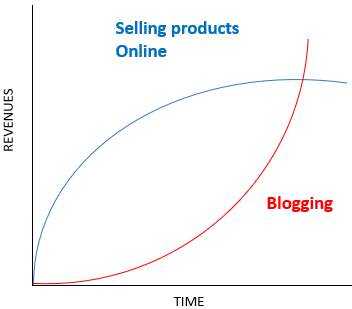 So, Should I Start A Blog or Selling Products Online? If you have little or no budget to start selling products online business or if you don’t know what business you want to start with, I would advise that you start a blog and get yourself known in your “Niche” and create a website promoting affiliate marketing products within your niche. 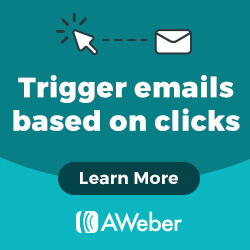 If you want to build on a solid base, get an audience to your blog, all while learning your way up the ladder step by step and create a passive income, Wealthy Affiliate is my recommendation. READ Bulletproof Profits [Review]-Get a real preview of what's inside! Blogging will eventually, with experience, make you an expert in your field, without having to worry about carrying inventory, customer support or importing goods from overseas etc. 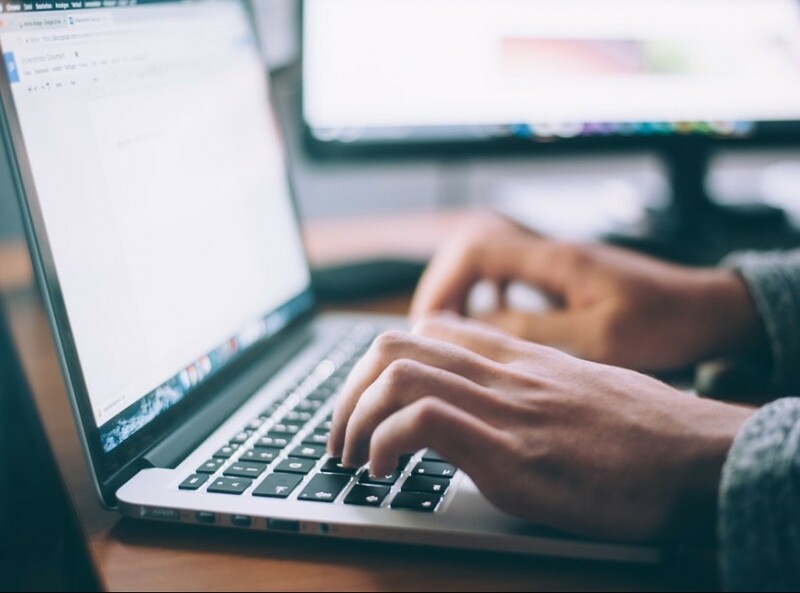 Blogging is also an excellent way to get your ideas out there and establish yourself as an authority, being a helpful problem solver for your potential customers. When I first started, I had no idea where to start. 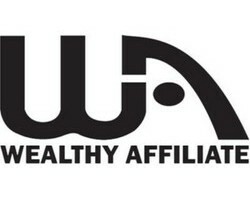 Then I found the platform called Wealthy Affiliate. It is the best and most advanced training platform on the Internet, to learn how to make money online using affiliate marketing. First, you need to have an actual website and own your own domain, this is absolutely required. Then you need to learn how to run your website. Wealthy Affiliate is using today’s best platform available for blogging which is WordPress. Then you need to scale your website as an authority in your niche so that you get traffic, and eventually affiliate sales. But money aside, blogging is an incredible way to express yourself, help people doing it and to build an audience. 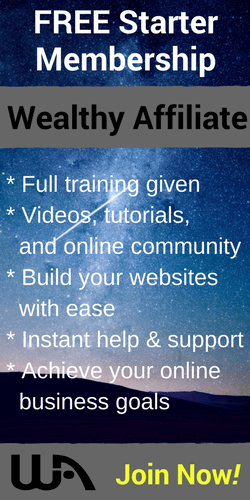 With Wealthy Affiliate, you will learn how to use WordPress, get a domain for your website, and learn all there is to know about Affiliate marketing, all within this wonderful community of over 1,000,000 members. The best part is that it’s FREE to join and there is no credit card required or any obligations. They will even give you 2 free websites when you join and a 10 lesson free training. But don’t just take my word for it, go and check it out for yourself. Like I stated earlier, building a legitimate money-making blog doesn’t happen overnight. There is a lot of work involved, but once you get the motions rolling, the sky is the limit. If you want to see how I make money online, click on the link below and create your Free account, no obligation, Credit Card required! 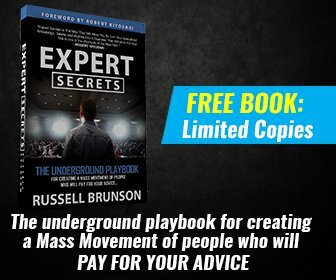 I also invite you to check out my Free Guide: Work Online From Home And Make Real Money! In this guide, I explain the basics of Affiliate Marketing and how to create your own online business! I think that you niche about horses can really do both, be an authority for horse owners,to give them precious and helpful advice, and also to recommend them to products related to your niche. Go ahead you are on the right track. Your target audience is the same for both a blog and selling your products, so you can definitely do both. A great post this one is, I loved and appreciated what you taught me here today, I have website selling my own product but it has not been doing really well in the market so I will start by blogging first to see what happens, Thanks a million. Hi Dave, Thanks for stopping by! I’m glad that you liked my article and that it made you take a different approach to your online business. 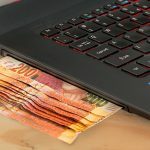 There are so many ways to make honest money online, and blogging or selling products online are just two of many ways. I wish you success for your future! We totally agree. Starting out can be overwhelming. Wondering what to sell, learning how to get traffic so people will buy your product and even learning how to build a website correctly can leave you in a state of shock. There is a lot to learn to make money online. You make a great point by starting out with a blog. Great idea. That way you start building your brand and working your way into a niche. You got to build a foundation first. Just like when you build a house. You don’t put the roof on first. You lay out the groundwork and build a solid foundation. Around 30% of online marketers use WordPress. It’s a long term solution and a great content management system. Your going to need hosting and training. Looks like you found the smart solution with Wealthy Affiliate. We are going to agree with you. It’s the best value you will find online. You get the training, hosting, and a fantastic community to help you out. I’m “grateful” that you agree and that you have found your way to Wealthy Affiliate too. It is the best way to start, by building a solid foundation. Determination, persistence and a lot of hard work are also the key to success. Thanks for your input on my website. Choosing a niche was difficult for me. I actually switched it up a couple times. I found that it is so much easier to blog about something you enjoy. It makes it a lot quicker to become an expert in your niche and gain followers. Yes it’s definitely a lot easier to blog about something that you are familiar with and enjoy. You should always try and do something that makes you happy, then what you do will not be considered working. Once you can get to that place, you will not work another day in your life.